Whether you already have an AC system in place or not, it is worth considering a supplementary form of cooling to help alleviate the high costs such as a box fan, but how do you find the best box fan?. A box fan offers many benefits, especially lower cooling bills given how extremely cheap box fans are to run and their price point is quite reasonable. 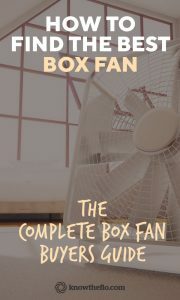 Because it can get pretty daunting when you’re looking at all the choices that are available, we have included some box fan reviews so that you can find out about some of the most popular models on the market. We’ve also added some buying information too so that you have enough information to choose the best box fan for your home or workspace. Before you buy it is worth noting that box fans are cheap, often made in China so can sometimes have small defects. If you are unluckily enough to get one, keep your reciept and don’t settle for a faulty unit. 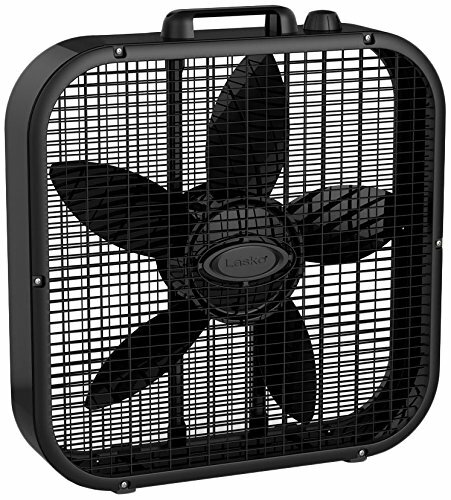 The Lasko 3720 Box fan ticks a number of important boxes when it comes to choosing a box fan. If you are intending to use this box fan in your window then this fan is a good choice as it has weather resistant shielding which not all box fans have. This helps protect the motor from the elements it will be exposed to in your window, though it does NOT mean its waterproof, in fact, the user manual says not for outdoor use. You are also able to easily move this fan around the home as it comes with a handy carry handle for easy portability. Lasko has also put a little bit more width into this fan which gives it more stability. Stability is important given the shape of these fans being slim and narrow and not having a wide base. The placement of the speed dial is also important and on this box fan the speed dial is located on the top for easy access. You can be comfortable with the safety of this fan as it is ETL listed. Some of the reoccurring cons from the people who have bought the fan were that they found the fan to be loud and that it is a little bit light. 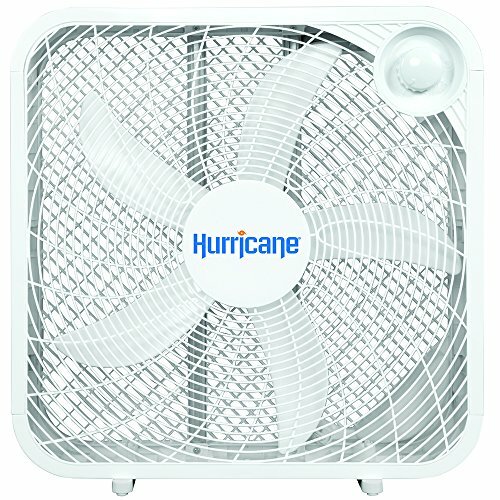 The Hurricane 20 inch box fan is probably a good option if you are looking for a fan that blows a good amount of air but you don’t mind the noise. The consensus seems that this fan blows good air but is quite loud. It comes with a nice wee tilt feature, where you can tilt the fan around 15 degrees and direct the airflow slightly more than your average box fan. The speed dial for the fan is contentious in its placement. The dial is located inside the fan area where other fans generally have their dial on the top. By having it in the fan area it means there are no obstructions if you use the fan in the window, however, a number of customers did mention they were not overly happy about where the dial was placed and preferred having it on the top of the fan. Having sifted through hundreds of reviews there seems to be a general consensus that this fan is quite loud for a box fan. It seems to blow a lot of air but at the expense of noise. Also, if you are on Amazon reading reviews, be that you filter the reviews as many of the reviews are for other fans, so the feedback looks a bit deceptive. 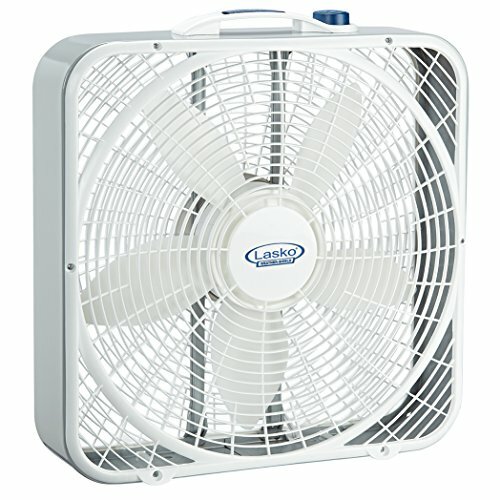 Much like the Hurricane box fan above, the Lasko B20401 is one of those fans that seem to trade off airflow for noise. It got a lot of feedback about being loud but also moving a good amount of air. It comes with small attachable feet which can be put on and removed at will. This adds a little more stability to the fan. The defining feature of this fan is the fact it comes in black. Many purchasers made the decision to buy the fan due to its color and style, even saying that even if it is dirty it tends not to show up like on other, white box fans. It comes with a carry handle on the top of the fan for easy portability and also has the 3-speed dial on the top of the fan, much like other Lasko box fans. Much like other box fans, a few recurring criticisms were made in regards to the build quality. It was also mentioned a few times that this fan can be a little unstable and fall over a little bit too easily. The Lasko 3733 box fan is a comes in a couple of colors, the grey and the black which is a popular choice as it looks more stylish and also does not show the dirt like lighter colored fans. It has 3 speeds and the speed dial is on the top of the fan also, like other Lasko fans, it comes with a carry handle on the top for easy portability. The fan is ETL listed, so has passed safety testing, however unlike a lot of other Lasko box fans, this particular fan does not come with weather resistant finishing, so is not ideally suited for windows where the fan will face the elements. One customer tested this fan along with a number of other box fans and found this fan used mid-range power (w) compared to other similar fans, though the amount of power between their fans, and what they end up costing is negligible unless you count your money right down to the cent. During the test, this fan was also recorded to produce medium-range noise compared to others. Not unlike other box fans, some units fall victim to poor construction and materials, causing defective units. Mainstays 20 inch box fan is good value for money. The fan itself has 3 speeds and its construction has minimal screws and snaps into place rather than being screwed together around the unit. This was one common complaint people had as it made it hard for people to take apart to clean the fan. The blade design is a little different to other box fans and was commented on by a number of users about how this helps produce more airflow. The fan is sturdy and has a good base which means it doesn’t succumb to tipping like some other fans do. It also comes in a number of colors including black which many people prefer due to dust not showing up and the fan not looking dirty all the time. The controls for the fan are found on the face of the fan, rather than the top like the Lasko fans. Hard to take apart to clean. The Lasko 3723 is probably what you would call a run of the mill box fan. According to one reviewer who tested a number of fans this fans stacks up about the middle of the pack when it comes to power usages (W) noise and airflow. That’s is neither bad nor good, which in a sense sums this fan up. For the most part, the fan gets positive reviews. It does what it is meant to do – blow air. The speed dial is on the top of the fan and so is the carry handle like the other Lasko fans we have reviewed in this article. It has a durable steel body and has 3 speeds as well as being ETL listed. Unlike the 3720 however, it does not have weather resistant coating so this is not a fan you are going to want to use when exposed to the elements. But again, sadly, being a cheaply made product with cheap materials some units are susceptible to quality control issues. Most of the time you are likely to get a reasonable box fan, but just in case, remember to keep a receipt and not settle for a lemon. It is not weather resistant and on occasions suffers from quality control issues. While what would be called a regular box fan will measure around 20 inches or so, there are many people who prefer a small box fan for the extra convenience and portability. You are able to a get a 12 inch box fan, 10 inch box fan and 9 inch box fan, which is probably the smallest before you start getting into the category of personal fans. What to look for when buying a Box fan. An important consideration with any fan you purchase is how powerful the fan is. Wind power in a fan is measured by CFM’s and the more CFM moves, the more powerful the wind power (generally speaking). For the most part, CFM in a box fan does not vary all that significantly and may range from around 900CFM to 2500 CFM. You can see a comparison of some of the more powerful box fans here. With all that said, the difference 1000 CFM will make will be significant so it is wise to decide how powerful you want your fan to be before you buy. You will likely find most typical box fans are about 20 inches. However, if the particular size is important to you-you will want to check the other dimensions. For example, many people use box fans in their window, and window panes will vary in size and space. There is no point purchasing a box fan for the window that won’t sit correctly. 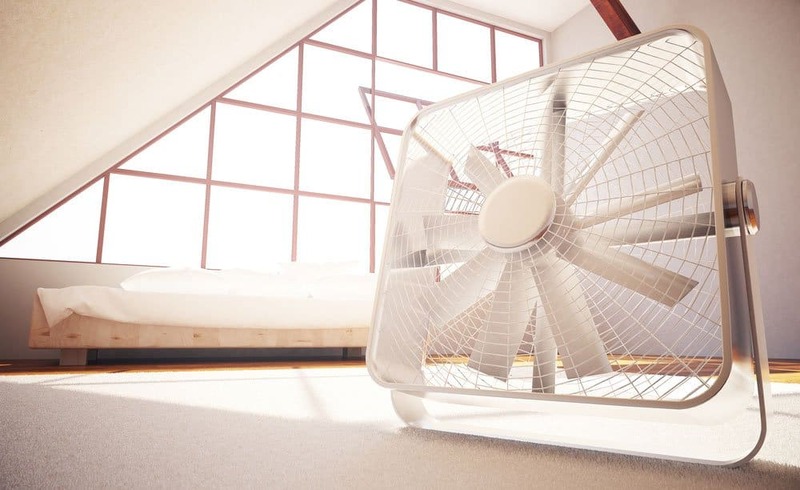 If you just intend to use the box fan on the floor or somewhere similar, it may not be as big of an issue, but the size of the fan is always worth thinking about before you buy. 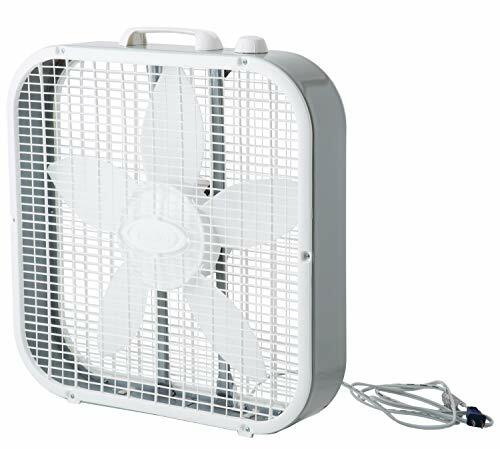 Unlike a lot of other fans, you will likely find that box fans typically don’t have a whole lot of features. There might a few little design elements like a carry handle, small leg stands and obviously a speed dial, but outside of those box fans do not tend to vary much in terms of features. There are a few different applications for a box fan and the considerations for each may be a little different. Often people will use a box fan on the floor, or on a table and there are a few things above and below to think about. However, a common application for a box fan is using them in the window as a window fan. First, you may want to consider is a box fan or window fan best for this application? Where is the speed dial? It may seem like a silly question but there are some box fans out there that have the speed dial on the back of the fan rather than the side or top. This obviously makes things a pain in the bum to change speeds along with making it a less efficient fan for using in the window. If your location is susceptible to the elements then you will want to make sure that you get a box fan intended to withstand them. Not all box fans are made for that application so before you buy make sure you look for a box fan that is made with materials that can deal with the exposure conditions or purchase a fan that has been weatherproofed. Having the feet at the bottom of the fan has known to cause some issues when the fan is being placed in a window. Does the fan you are purchasing have removable feet? Or does it not have feet at all? As mentioned above, measure your window first and make sure you are buying something that is going to fit in that space. Box fans are tall and thin, so physics demands that they have a good base otherwise you will be continually be picking them up. A number of fans provide “feet” at the bottom of the fan to stabilize them. We have to remember these fans will be moving a lot of air to good stability is important. Be sure to read reviews about the fan and if you see a lot of negative reviews about poor stability or vibrations, think twice. In the application you intend to use the fan, will the noise bother you or do you need a quiet box fan. For example, if you are putting you fan in the living room where you will be watching TV, then ideally you will not want a loud fan. On the other hand, many like, or even need some white noise in their bedroom when they are trying to sleep. This is very common and box fans actually serve this purpose well while also providing cooler surroundings. Consider where you will be putting the fan and how much a noisy fan is going to impact your purchasing decision. Box fans are really very energy efficient as they are and most wouldn’t use over 2 cents per hour. We will run through the metrics a bit further below. Filters are an additional feature which you can add to a box fan in order to purify the air. You can purchase box fan air filters which sit over the top of the box fan. This is great if you are using your box fan in the window as this can help alleviate pollens and dust which, if you have a sensitivity to, can really make a difference in comfort. 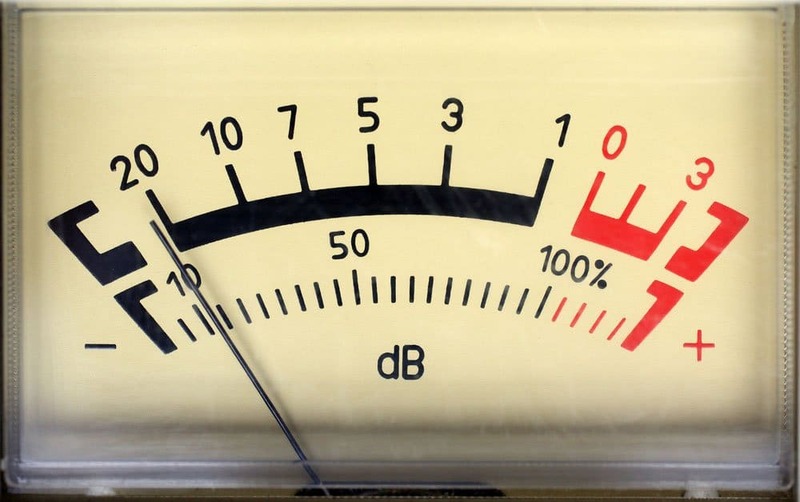 The last thing you want, especially if you are using your fan at night for white noise, is a fan that vibrates on the higher (or even lower) speeds. This can be an issue with some box fans so again, be sure to read through reviews to determine if the model you are looking at has this problem. There is nothing worse when you are trying to sleep than a perpetual clunking noise coming from a low-quality fan. Box fans actually provide a bunch of benefits that other fans may not and below we will run through what they are. As mentioned above, a number of people like to have white noise in the room as it helps them get to sleep. The right box fan can provide a nice ambient white noise which many people have commented, on various models, help them get to sleep. The beauty of box fans that you don’t get with other fans (except window fans) is you are able to use them in a window and choose between pulling air in from outside or pushing air from inside out. This can be useful for a number of reasons, for example, if you have an odor in your room you would like to get rid of, a box fan can help propel it outside. The same works for warm air, perhaps its warmer inside than out, so you can push that warm air out. Either way, you have the option. Just turn the fan around and you will be blowing the opposite direction giving you great versatility. Again, unlike other variations of fans, box fans are able to also act as an air filter with the addition of a filter. These filters are easily added to the fan and provide a cheap, quick and easy way to help purify your air a little more. 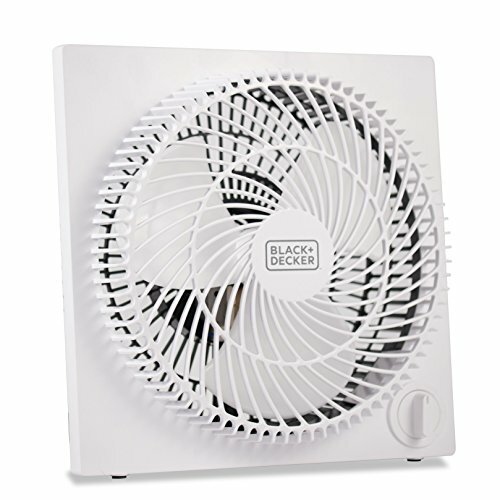 Becuase box fans are so simple in their nature and are generally quite small these fans are highly portable. Move the fan between your windows, floors, table with ease. 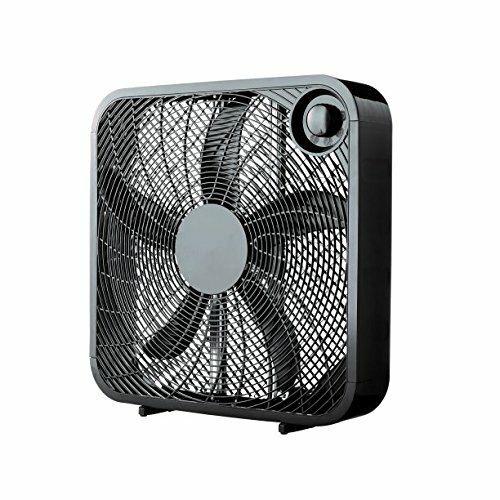 If you purchase 2 box fans you are able to make a cross breeze through your room which is a very effective way to cool. Position one fan sucking in air from outside on one side of the room with one fan on the other side of the room blowing the air out. This will create a cross breeze. Keep in mind the direction the wind is blowing outside for better efficiency and also keep in mind the location of the sun and where the heat is. Cleaning a box fan is not difficult, but just takes a bit of concerted effort and 20 or so minutes to do. – Unscrew the grills on the front and back and wash the grills, removing any dust. – Clean the fan blades themselves. You can do this with a cloth and some cleaning liquid, or use a can of compressed air. Try not to get water in the motor, and wet the cloth rather than the fan itself. – Once done screw the grills back on. Here are a couple of Guides. We mentioned above the cost of running a box fan is very cheap. Box fans use very little power and are really, a very cheap way to help cool your room. While they may not replace an air conditioner, they can certainly help reduce their usage. Below are some common questions about box fans and their energy usage. • How much does a box fan cost to run? Let’s take one of the most popular box fans as an outlier. Let’s assume the fan runs for 12 hours a day at 10 cents per kWh. 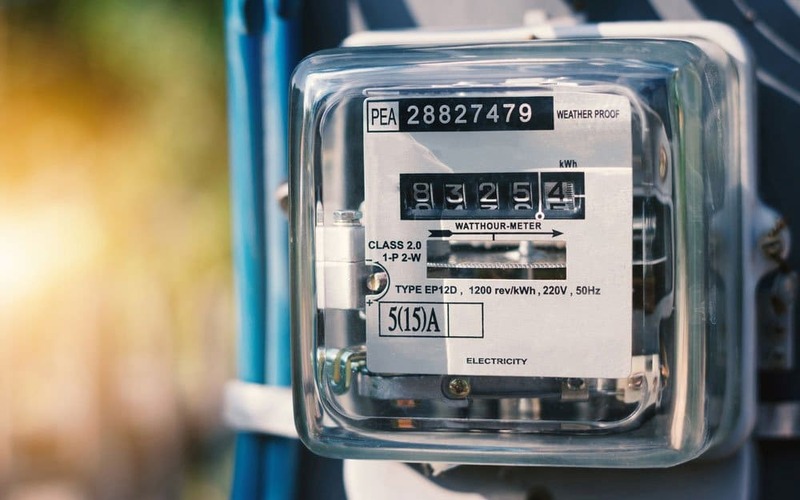 Given that you are not likely to use the fan every day of the year, the cost is likely to be around 1/4 less (if we presume a season is a quarter of the year). Those are very low energy usage stats. Again we will use the aforementioned box fan as an outlier. You will likely find most box fans amp usage might vary a little but will be in a very close vicinity to this particular box fan. • How many watts does a box fan use? As above, watts on a box fan might vary from model to model, you will find the watt range to be from around 45W on a low setting to 110W on a high setting. 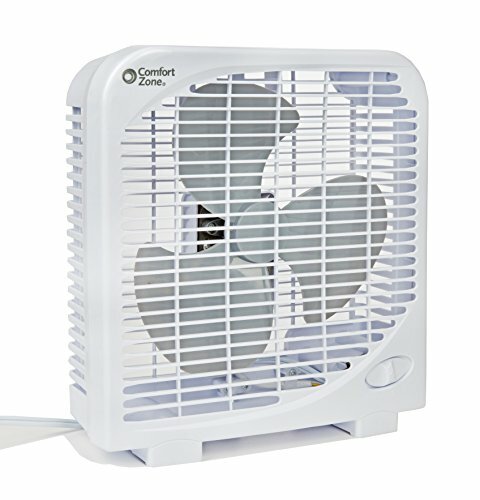 What are the alternatives to box fans? In our comprehensive article about the different types of fans, we run through all the various types of fans for the home and what each might be good for. In this case, if you are looking to use your fan in a window but do not want as much power you could have a look at window fans. If you are looking to use your fan on the floor but need more power, could look at a floor fan, pedestal fan or tower fan. Pedestal fans offer more features and more height and direction control and convenience with remote controls. Tower fans offer similar options to the above, although the fan itself is usually not as high as pedestal fans and they also tend to be less powerful. Floor fans are basically the big brother of a box fan, so if you are looking for an industrial box fan, this is your best option. They are very simple in regards to features and simplicity but offer far more power, but compromise on manoeuvrability and you obviously won’t be able to use in a window! Thanks for reading! Feel free to leave a comment if you have something to add, we would love to hear from you! 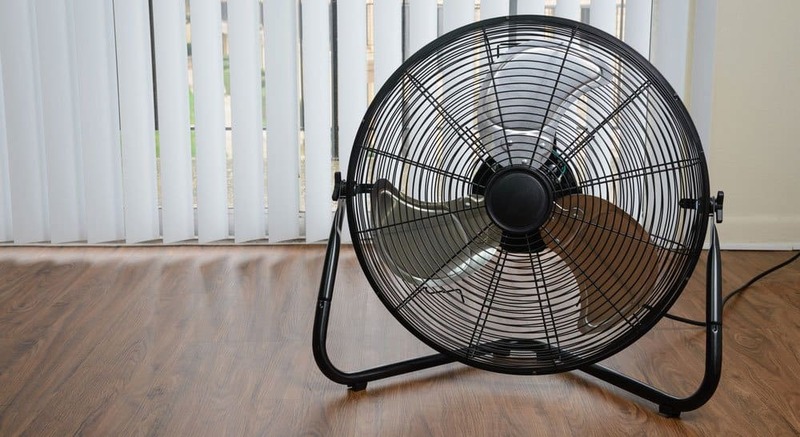 A buyers guide to finding the best box fan for your home. What brand is that beautiful fan you show with your logo??? 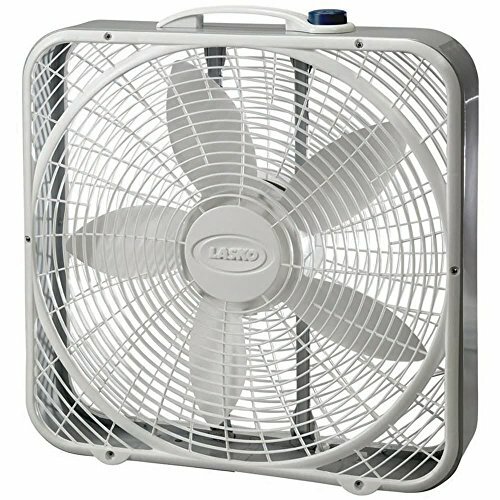 There has to be some beautiful fans out there called box fans beside the lasko plastic fan blades ? Not sure about the logo? Unfortunately, the plastic fans are the most common and most available. They are cheaply made, and probably make the big companies the most profit. If you are looking for something more unique and custom, try looking on Etsy, there are a number of varieties on there.